Let our consultant and designer come to you at the comfort of your home. We can work around your schedule to make sure you are free of any disturbance which might affect your focus and decision. We can set appointment as early as 7:00 in the morning, and we are ready to spend 1 hour to 1 ½ hour to go over all the information and details. 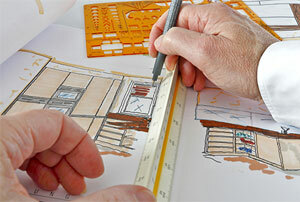 We design your Custom Built project based on your needs, life style, and specifications; so you can ask any question. You have any right to know as much as possible about what is involved with manufacturing your project, what are the possible options, any question about your project’s design, what we can offer, and why choosing Smart Design LLC for your Custom Built Cabinetry. Consider the possibilities. Let our designer discover your personal style. Our designers will listen to you first, so they can combine your specifications and needs with their design excellence and experience along with ideas you will find very helpful and functional. Our designers will help you through this one step at the time. One project at the time. 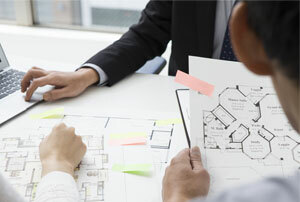 We build from scratch and we ensure consistency across your entire project. You are in good hands. Quality begins with through design and continues through out the manufacturing process to the end. From the moment you place your order, our craftsmen put their efforts with the efficiency and precision of modern technology to build and finish together your cabinetry to the highest quality standards, while we offer you the best possible value. Please browse through our material and finishes to get more information . Your entire project goes though a hands-on process step by step from cutting on table saw, assembly, to the last touch of details and quality control. 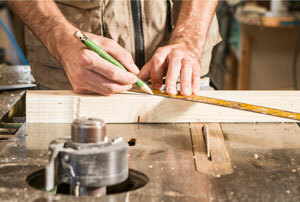 Once your custom cabinetry is ready, our office will contact you. You will be given 10-14 days to schedule a day for delivery and installation of your cabinetry. Our professional installers are determined to give you the last experience of your custom built project journey with Smart Design LLC. Choosing the right material for your project is important. From an A grade hardwood plywood and solid wood of different species such as Maple, Mahogany, Oak, Cherry, Alder, and Pine to a wide variety of decoration hand carved details. Also the latest in hardware are put together to accommodate your design style from modern to traditional. No Press Boards or Particle Boards are used. High standard and Craftsmanship is only possible with high quality material. 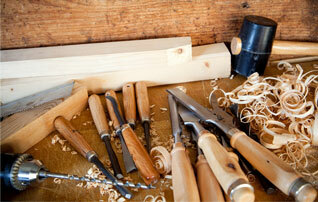 Applying glue, staples, and screws guarantee the strength and life time of every built cabinetry. Click on the link below to find out about our suppliers and their products. All Smart Design LLC cabinetry receive exclusive furniture finishing process, result in one of the finest and most durable finishes available in the industry. Preparation is one of the key process in finishing. All surfaces are hand sanded to provide a smooth consistent surface for a stain topcoat. First, a wood conditioner is applied to all surfaces. Next, deep penetrating hand sprayed and hand rubbed stain to reveal the beauty of grain. After everything is air dried, two coats of high solid, durable wood sealer, followed by two high solid clear coats are applied and again all surfaces are hand sanded between each coat. 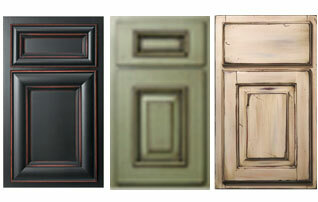 Below you can find some of the finish styles we offer. It is not difficult to look after your cabinets. Here are some tips on the best ways to clean and care for your cabinetry. Cleaning. Once your cabinets are installed, wipe down all exteriors and interiors with a damp cloth to remove dust. Complete a small area at a time and wipe dry. You may use this method any time you wish to clean your cabinets. Everyday Care: It is important to wipe up spills and marks as they occur. For kitchen cabinets, give special attention to areas around the sink and avoid dropping damp or wet dish towels over doors. Touch Up. 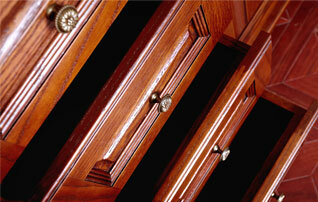 As careful as you may be, damage to a cabinet could eventually occur. That is why we provide you with a touch up kit designed for your specific cabinet color and style that would help you with minor repairs to a damaged surface. Our installers will answer any question you may have. Note: substantial repairs should only be attempt by professionals.